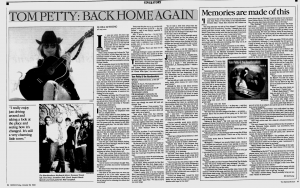 It was just about 20 years ago that Tom Petty said goodbye to the old hometown. Along with the four other guys in the band Mudcrutch, he threw his gear in a van and left Gainesville forever. His goal was to become rich and famous. Oddly enough, that's exactly what happened. 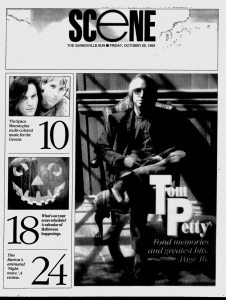 What a long strange trip it's been for Tom Petty, the skinny, scruffy blond kid from the northeast section of town. He's 43 now, an internationally recognized rock star who counts Bob Dylan and two ex-Beatles among his best friends. Still, he remains closest to the Heartbreakers, most of whom he's known and played with since his nightclubbing days in Florida. Lead guitarist Mike Campbell and keyboardist Benmont Tench were in Mudcrutch with Petty; they knew drummer Stan Lynch from another Gainesville band that had gone west and promptly collapsed. 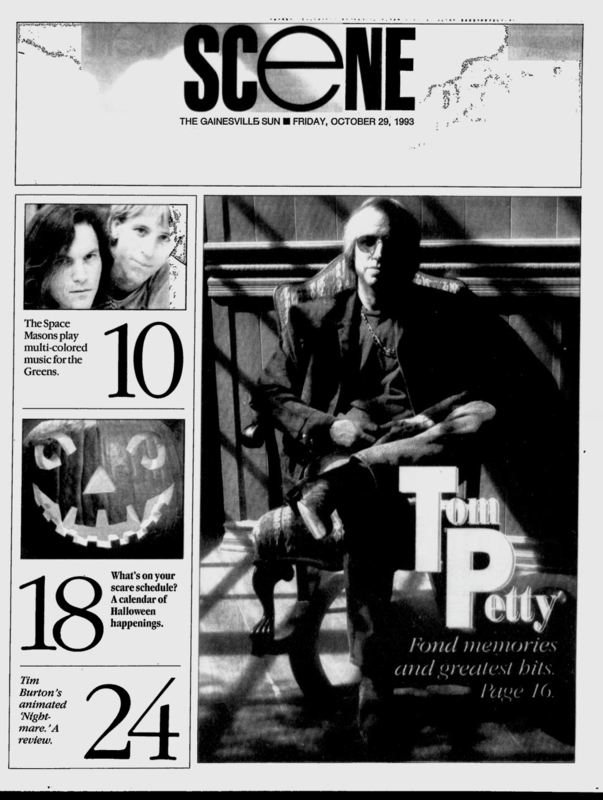 For Tom Petty, this is a year for looking back. Out next week is his first-ever greatest hits album, including his best-loved tracks with the Heartbreakers, songs from his hugely successful solo album, "Full Moon Fever," and two new Heartbreakers numbers recorded just for the occasion. A boxed-set anthology is in the works. On Thursday, he'll play the O'Connell Center, in a concert that'll be broadcast live around the world on FM radio. The show -- one of just three Petty will play this year -- is officially part of the University of Florida's Homecoming celebration. And a homecoming it is. It wasn't supposed to happen quite this day, Petty explains via telephone from his Los Angeles home. "Johnny Depp talked us into playing one night," he says. "He opened this club on Sunset Strip called the Viper Room. He came to us and said 'We're gonna have opening night, and I'm gonna give the money to sick kids, and please come play. You can play whatever you want.'" The band, which hadn't toured for two years, was at that moment in the studio laying down the new songs for the greatest hits album. "With a little arm-twisting I convinced them all to come play," Petty explains. "We played about an hour of just new stuff. We didn't play any old stuff. And we got a little buzz behind playing, and we sat around saying it was fun to play, we hope we do it again." End of episode. Petty then turned his attention back to the solo album he'd been working on before Depp's phone call. "Then I got a letter from some fella who runs the Homecoming thing in Gainesville," he says. "Several requests had come in over the years, would we come around Homecoming and play? "And of course we'd always thought, 'Boy, that'd be a lot of fun,' but it never worked into our plans." The letter-writer was Gator Growl producer Shawn Schrager. "And then at the same time we were approached to do a live radio concert that would go all over this country and to parts of others. I thought that would be a cool thing to do, as long as we're releasing this album and everything. "So we took a little time away from the other project, and I wrote a handful of songs for the Heartbreakers. We called 'em in ... I think the list was 30 songs in two days' time. So we had a lot to sift through." In two days time, they'd recorded nearly 15 songs. Included on the hits album are "Mary Jane's Last Dance," a bluesy Petty original that features his playing both harmonica and second lead guitar, and a cover of Thunderclap Newman's classic "Something in the Air." The latter song, a call for change in a world gone crazy, seems as relevant today as it did when it was written in 1969. Just days after the 1992 Los Angeles riots, Petty wrote "Peace in L.A.," a heartfelt plea for understanding. He recorded the song with the Heartbreakers, and had it released as a single -- with proceeds earmarked for L.A. rebuilding efforts -- within a week. "I do what I can," Petty says. "It's very hard to tell somebody what that was like, to be here when that was happening. It was very disturbing. And it was just my natural urge to do that, and I've always been real glad we did. "And we still get really nice letters. It obviously made some money for some really good causes." Although he likes to talk about environmental issues from the stage ("I've never really learned to shut up"), Petty won't go the distance and call himself an activist. He was one of the first rock 'n' roll artists to insist that cups at his shows' concession stands be made of recyclable paper. "A lot of people used their position to just hip everybody that there is a problem, and here's some simple ways you can help a little bit," he explains. "But these days, it's almost redundant to go up and say anything about recycling, because everybody does it." The idea of acting as a spokesman for an issue -- any issue -- is anathema to him, quite frankly. He's well aware that other rock stars speak out all the time, but that sort of thing is just not for him. "They're probably much more comfortable in the role of celebrity," he believes, "which I can honestly say I've never sought. And I have no intention of ever seeking it. I don't want to be a personality or a celebrity, I just make music, and that's the end of my job, really. "I don't go to things like premieres. I don't want to be on TV." But Petty's fans hang on his every word. Wouldn't be be able to make a difference? "Maybe they listen to me because they believe me," he replies. "It's hard for me to ever believe some of these celebrities -- I often wonder if it's an actor's business to tell me anything, or a musician. "But hell, I don't know. Really, my time is so consumed with trying to get songs done and records made, to do anything else is almost just a spontaneous move. "I don't know that I'm always right, or that I've got the right idea, but I think somebody's got to speak up every now and then. We still have a lot of things to work out in America -- the gay issue is one, and human rights in general. I think racism still runs rampant in some areas of the country. "These are things that I would be most interested in helping out. I think most importantly we have to treat everybody like humans and hope for the best." "It was kind of fun when I heard it all strung together," says Tom Petty of "Tom Petty & the Heartbreakers Greatest Hits," which MCA Records will release on Nov. 9. The song selection was left to Petty himself. "I was sort of flooded with a lot of memories," he says. "I thought they were pretty good little records, really. I don't ever put them on at home. I hear them on the radio, but the first time I'd sat down and really played 'em all in a row, it was kind of nice." After this one, his records will be released on Warner Brothers. "It was a nice way to end my long affiliation with MCA," he reports. "I think I'm leaving on a good note -- everybody's still friendly and everything. How long was it, 18 years? That's a long time to be there." Song for song, here's Petty's comments on the album. "American Girl: I remember we recorded it on the Fourth of July, and I remember a lot of talk about the Byrds when it came out, but Michael (Campbell, Heartbreakers guitarist) and I never really even thought about the Byrds until other people brought it up to us. "I remember when we got the take, we were pretty excited about it." "Breakdown": "I wrote that because, whatever song we did that day, we got done pretty early. And no one really wanted to go. "I'd already sent the band home, and I phoned them at 2 a.m. -- so they say -- and they came back tot he studio. We cut the track in a couple of takes, in a much shorter arrangement. "We were into very short songs at the time -- no excess -- because there was so much of that going on in that time period." Petty says he has no idea at all why he sang "Breakdown" with a cheesy Spanish accent. "Listen to Her Heart": "My wife Jane had gone, with (producer) Denny Cordell, over to Ike Turner's place. And she had been kinda cornered by Ike Turner and barely got away. She was saying it was this wild experience. "I don't really think I was writing to Ike. I think it gave me an idea and I took it from there." "I Need To Know": "I was trying to make a song like Wilson Pickett's 'Land of 1,000 Dances.' That's one of my favorite records. "I actually wrote that at Crescent Beach, Florida, at a friend's house." "The song hung around for a good year before we ever got it recorded, but we used to play it on the road. "It was one of those that really caught on with people." "Don't Do Me Like That": "Mudcrutch recorded it in L.A. around '74. It was something my dad used to say, 'Don't do me like that.'" "Don't Do Me Like That" became Petty's first Top 10 single, in 1979. "We never really took it very seriously," he said. "Even the Losers": "I think that's really a good song. I heard it the other day on the radio. "I remember that I didn't have the title when I went to the session. I had all of this song and then the chorus came and I didn't know what to sing, That just sort of blurted out of me on one of the passes and I went, 'All right! There's the title.'" "Here Comes My Girl": "Another one of Mike's, from the same demo tape as 'Refugee.' I got the idea for the narration from Debbie Harry, who we'd been playing with at the time. She did some deal where she just talked in the song." "The Waiting": "Don't remember much about 'The Waiting' except ... I think we recorded it on my birthday, because we were interrupted by somebody in a gorilla suit, one of those really awful telegram things. And he wouldn't go away. It was really annoying. We were just, 'Please, never let any more of these in the studio.' We were trying to cut this track, and the guy was trying to do 'his show', and he wouldn't leave until he'd done his entire act." "You Got Lucky": "Just a little pop song. We'd just gotten the synthesizer, obviously. It was probably the first germ of trying to break out of the bag we were in, musically. That whole album ("Long After Dark"), I think I was impatient with everybody and wanting to do something else. "That was the one chance I got to sort of feature the keyboard more than the guitar. It's a pretty hot little single, you know, pretty hot. Pretty good rhythm track. "I think I was already in the mind to make 'Southern Accents' by that time, and there was concensus around that I was maybe being crazy. So I almost felt like I was conceding to do the stuff on 'Long After Dark.' Although I enjoyed it; I really thought at the time we probably should've been doing something else, because it was so much like the stuff we'd done before." "Don't Come Around Here No More": "It's still one of my top three things I ever did. That one's way up there on my list; just as a record it's a lot of fun to listen to." What are the other items on the top three? "Couldn't say." "I Won't Back Down": "I like this one quite a bit, too." "Runnin' Down a Dream": "A terrific driving song, I think. One of the only songs I ever wrote about a car. Del (Shannon) had a good laugh about it. I gave it to him in an airport; he said he put it on on the plane and started laughing." "Free Fallin'": "'Free Fallin'' was really about Los Angeles and the San Fernando Valley. At the time, I was living in Beverly Hills and Mike lived in the valley, and I had to drive over Mulholland Drive, which is this kind of road that looks off to L.A. on one side and Hollywood on the other. It was formed driving down Ventura Boulevard. "It's a very active road. It's a kind of a trip just driving up and down it. "I'm very pleased that I was so embraced by the people of the San Fernando Valley. Anytime I go somewhere, they thank me for the song." "Learning To Fly": "I love that one. I just think it's one of my better songs. I wrote it with Jeff Lynne, and I loved the record. We had a ball doing it." "Into the Great Wide Open": "The problem with a lot of them, especially 'Don't Come Around Here No More,' people always think of the video. 'Wide Open' was one of my favorite videos, because it came out so close to what I envisioned. It was exactly like the movie in my head." "Mary Jane's Last Dance": "I'm still thinking of the right words to explain the song, but I don't know if I've come up with them yet." "Something in the Air": "It was one of those that we'd only played twice. And when we dug through everything, we all just oohed and aahed over it. We were so pleased with it, and we thought 'You know, this is probably the only chance we'll have to put this out on a record.' Because covers never seem to make the final album cut; the originals just get priority. "So we decided to stick it on. I thought it was a nice little message for the end of the album." Petty understands that not everyone will be happy with his choices. "There was a lot of things that some people wanted that there just wasn't room to put on," he says. "It's really a double album. They'll probably bring out another volume at some point."